Self-adhesive Vinyl lettering cut to your requirements. and far better fade resistance than cheaper printed vinyl. Click PRODUCT LISTING above for more sizes. mailboxes, bins, equipment, containers, machinery, etc. Weather resistant, vehicle grade vinyl. 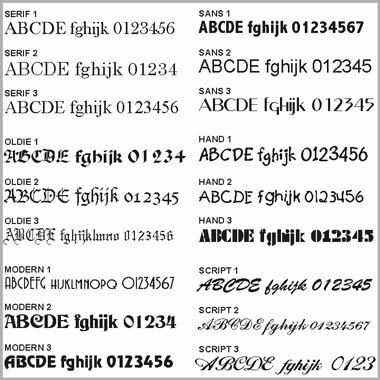 Choose from 18 standard fonts and 24 different colours. Normal cut, or Reverse cut to apply to inside of window. 77p per letter, No charge for spaces. Any keyboard entered symbol permitted. Click to see how to enter Special Characters. Lettering supplied pre-spaced on strip of application paper, just cut to required length, peel and stick. 'Oldie' and 'Script' Fonts are unsuitable for Upper case only text, (eg. LIKE THIS) as the letters may overlap each other, and letter spacing is irregular. Mixed case, 'Like This', is perfectly OK.
Orders for words in these fonts will be supplied as mixed case, unless specifically requested in the 'Special Instructions' section, which can be found in the checkout process. 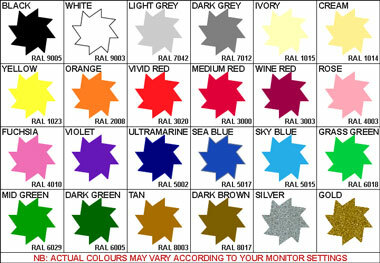 Signs for vehicles, such as van lettering, car signs, bike stickers, boat names, business vehicle advertising etc. Shop signs, including window stickers, point of sale, advertising signs and much more. Domestic DIY use, such as signboards, notice boards, temporary signs, scoreboards, House names etc. Spaces Free. Enter up to 50 letters per line.